High Levels of Sea Lice Detected at Irish Salmon Farms. This entry was posted in Uncategorized on December 31, 2012 by DamienOBrien. This entry was posted in Uncategorized on December 28, 2012 by DamienOBrien. Grealish raises concerns over proposed salmon farm for Galway Bay. Whilst Ireland has finally ratified the Aarhus Convention giving Irish citizens the same environmental rights as the rest of Europe, the European Commission referred Ireland back to the Court of Justice on June 21 to bring its national legislation on assessing the effects of projects on the environment into line with EU rules. The Commission has requested the ECJ to impose a lump sum fine of over €1.8m and a daily penalty payment of over €19,000 for each day until the infringement ends. ‘Despite an earlier referral to the Court and a subsequent ruling in March 2011, Ireland has not yet ensured the full transposition of the Environmental Impact Assessment into national law,’ an EC statement reads. Land-based fish farms now part of aquaculture’s future. Fisheries authority reiterates ‘serious concerns’ over fish farm plan – Community News – Limerick Leader. A REPORT by the Marine Institute shows infestations of sea lice on salmon farms in Ireland are higher than limits set by the government. Some farmed salmon were found to be contaminated with up to 71 sea lice each, more than five times the acceptable threshold. Conservationists say wild salmon are slowly becoming extinct as a result of sea lice infestations caused by fish farms, where high levels of the marine parasites are found. Wild juvenile salmon and sea trout, which are vulnerable to “clouds” of sea lice in their free–swimming larval stage, can become heavily infected with the parasites as they swim past fish farms while leaving estuaries. Sea lice pose little threat to adult fish, but can kill juveniles whose scales are softer and cannot protect vital organs against attack. 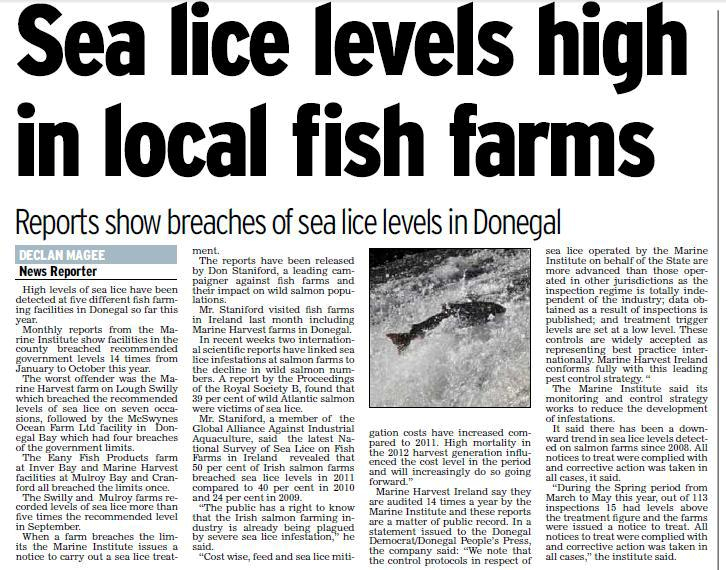 Among the farms identified by the Marine Institute as having “elevated lice levels” during September and October were those run by Mannin Bay Salmon Company in Co Galway and a Marine Harvest fish farm in Lough Swilly, Co Donegal. Damien O’Brien, a spokesman for No Salmon Farms at Sea, a campaign organisation, said sea lice were having a detrimental effect on wildlife fish stocks. “There are surveys that show that up to 39% of young salmon smolts are killed after being infected by sea lice while swimming past salmon farms. “High concentrations of salmon in confined spaces attract the parasites. It takes 11 sea lice to kill a smolt. 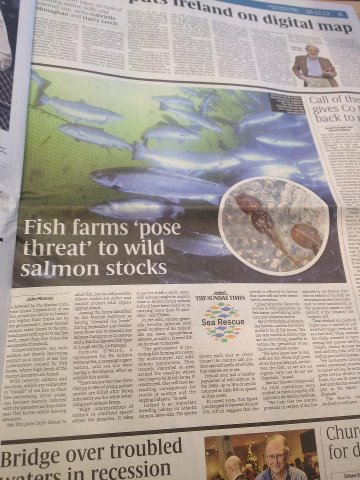 Some wild salmon caught by anglers close to salmon farms around Ireland have been found to be carrying more than 50 parasites,” said O’Brien. In the wild, salmon generally become infected with small numbers of the tadpole–like sea louse, Lepeophtheirus salmonis, as adults. Farmed fish are far more vulnerable. “The government is promoting fish farming at a cost to the environment and wild salmon populations. They recently identified 30 sites around the coastline where they hope to build fish farms. If constructed, they will have far–reaching consequences for stocks of salmon and the angling industry,” he said. Ireland is an important breeding habitat for Atlantic salmon, Salmo salar. The species spawn each year in rivers around the country and produce approximately 4m smolts, that migrate out to sea. Ireland once had a healthy population of wild salmon. In the 1980s, up to 20% of smolts returned as adult fish to spawn in Irish rivers. In recent years, that figure has dropped to between 8% and 10%, which suggests that the species is affected by factors that have still not been identified by scientists. Conservationists blame the decline in wild populations on fish farms, over–fishing, pollution and unknown factors. Gerry O’Donohue, of Mannin Bay Salmon, said sea lice were a problem for all fish farms. “We are very careful to ensure that we do everything possible to reduce the prevalence of sea lice in our salmon stocks. “We have learnt how to deal with sea lice. When high levels of sea lice are detected, we harvest the fish, as we are an organic farm and do not use chemicals,” he said. Marine Harvest Ireland said its Irish operations were audited 14 times a year by officials from the Marine Institute. “We note that the control protocols in respect of sea lice operated by the Marine Institute on behalf of the state are more advanced than those operated in other jurisdictions, as the inspection regime is independent of the industry,” the company said. “Data obtained as a result of inspections is published and treatment trigger levels are set at a low level. These controls are widely accepted as representing best practice internationally. Marine Harvest Ireland conforms fully with this leading pest control strategy. The Marine Institute declined to comment. With questions hanging over the future of the wild Atlantic salmon, a big money–spinner for Irish tourism, few issues provoke more heated controversy than the operation of fish farms off Ireland’s coasts. The impassioned nature of debate around this contentious topic was seen at the weekend when 200 people from all parts of the country gathered in the rain outside Marine Minister Simon Coveney’s constituency office in Carrigaline, Co Cork. Their protest was against a Bord Iascaigh Mhara (BIM) proposal to locate giant salmon farms off the west coast. Jobs, money, and environmental concerns already dominate debate on both sides of this argument. For BIM, the aim is to create 500 jobs at three super–sized deep–sea salmon farms, the first at Inis Oírr in the Aran Islands, each with an annual harvest capacity of 15,000 tonnes. Doubtless, the opening of the China market to salmon exports from Europe is an influential factor. For the opponents of this development — anglers, fishing organisations, stakeholders, hoteliers, restaurateurs, and islanders — the fear is that if such projects go ahead they will make thousands of existing workers redundant in tourism, angling, and the shellfish industry. Meanwhile, amid the ongoing battle of words, the survival of wild salmon is in question. Recently thought to have been “saved” from virtual extinction by the removal of drift nets, the Irish salmon is now believed to be at risk from hazards that include climate change, river and lake pollution, as well as alleged poaching and illegal drift netting off the Donegal coast. Scientific research suggests that valuable salmon stocks off the west of Ireland are in danger of being decimated by a predicted explosion of sea lice, lethal parasites which invariably multiply around fish farms and are claimed to kill large numbers of free–ranging salmon in European waters every year. According to BIM, the State agency responsible for developing the seafood industry, its handling of this project marks a “new departure” in planning terms. It will act as the licence applicant for all three farms, with the licences being held in trust for the State and commercial developers operating the business under a franchise agreement. To give Mr Coveney credit, he signalled in advance that he would not be present to receive a petition from the protesters picketing his constituency office. However, he risks compromising his ministerial position as he is widely perceived as supporting the BIM project. Arguably, he could be accused of conflicting with the public interest if his department grants BIM the licence. With such a controversial decision in the balance, the Government will be in the firing line if jobs are put at risk in a region so heavily reliant on tourism. It would be a travesty if objections to the BIM proposal were dismissed out of hand by the administration because of ministerial support for the venture. To bring transparency and objectivity to this heated dispute, there should be no question of matters being decided behind closed doors. The conflicting interests make it imperative that BIM’s plans for three giant salmon farms be scrutinised in the public gaze.